If you follow my Instagram Stories you’ll know I was working on the front entrance closet reno for quite a few weeks… My original plan was to title this post “How to Renovate a Closet in a Weekend.” Total fail there since it took much longer! The biggest reason it took longer was the fact that I start a million projects at once, get side tracked easily, have a 3 year old and, well, life happens somewhere in there too! 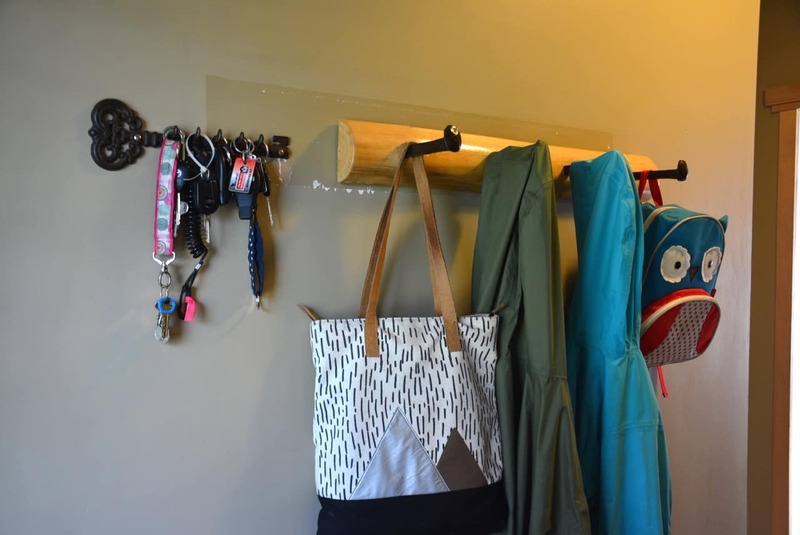 The truth is, I paid about $15 for the wood dowel closet rod and rod hangers and I bought a gallon of pain for about $60. Those were my only out of pocket expenses. I could have gotten away with not buying a new can of paint, but I knew it would be used for other projects so I splurged. Now that’s a pretty darn cheap reno if you’re asking me! Keep reading to find out how I made this happen and how you can do this too! Here’s a few photos of what I was starting with! Since the day we moved in we haven’t use the front entrance way closet. The shelving was hokey, it got stuffed with junk (including the junk the previous owners left) and things just sat there. As they sat there, the front entrance way filled up with our shoes, jackets all over and was a cluttered mess when you walk in the door. It drove me nuts. 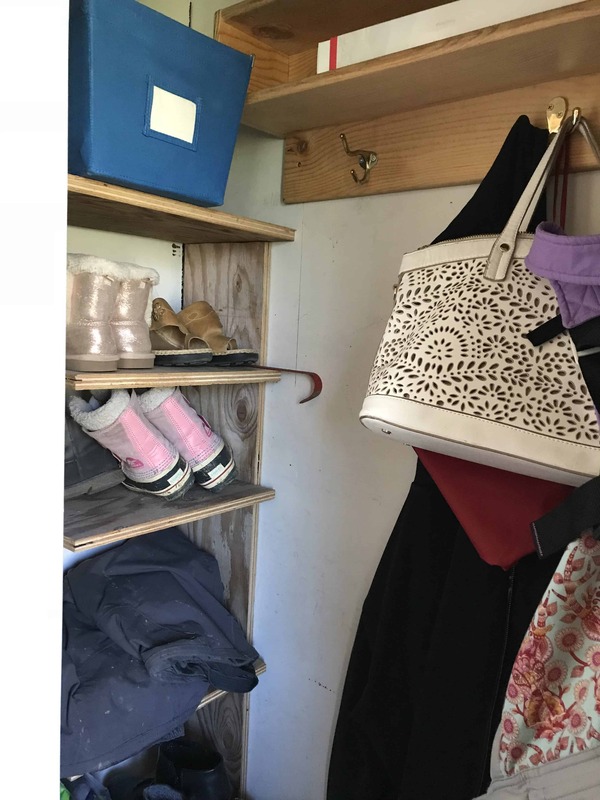 My goal with this project was to make the closet useful to store jackets and shoes, get rid of the jackets and shoes we don’t use or need and and have a tidy entrance way that makes you feel good when you walk in the door. The catch is, I wanted to do it myself and surprise my husband because I knew he had other projects he wanted to work on, like the woodshed. I did most of it myself, but luckily for me we had a rainy day when my husband was home so he couldn’t work on the woodshed and ended up helping me cut the shelving boards. 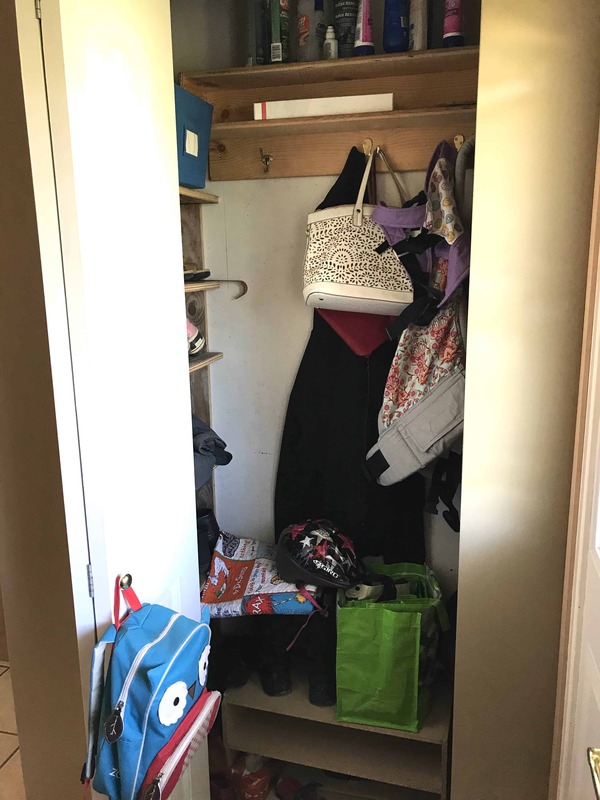 If you haven’t done a lot of house renovation projects but want to try, a closet is a good place to start! As I mentioned above, I only spent out of pocket money on the closet rod, ends for it and a can of paint. The rest of the materials we had at home and we did it ourselves (my husband and I, but mostly me 😉 ). I will quickly walk you through what we did though. Remove everything! I stripped the closet down to nothing! Sand. The inside was plywood and I gave it all a quick sand and clean with a damp rag. Caulking. I put this down all the corners because there were gaps in the plywood. Make sure to use paintable caulking. Paint. I painted the ceiling and walls all white, 2 coats. Build shelving. 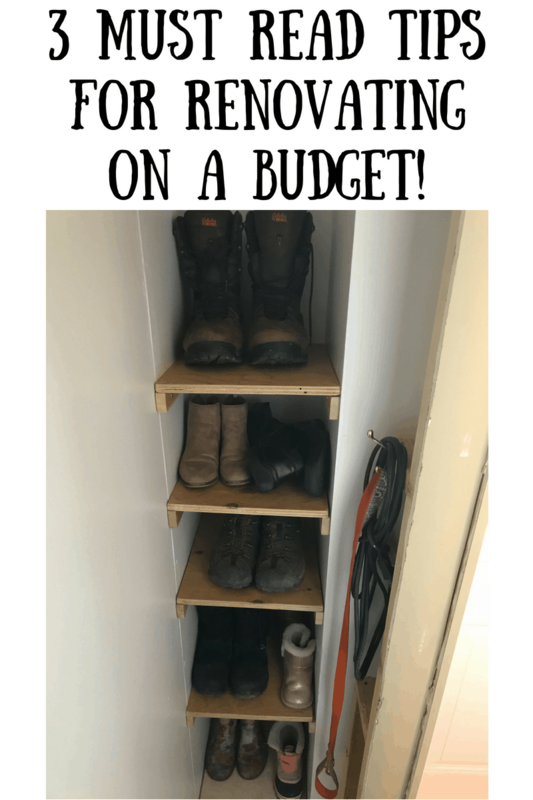 We used scrap plywood and built a shoe rack at one end and placed a rod down the centre. 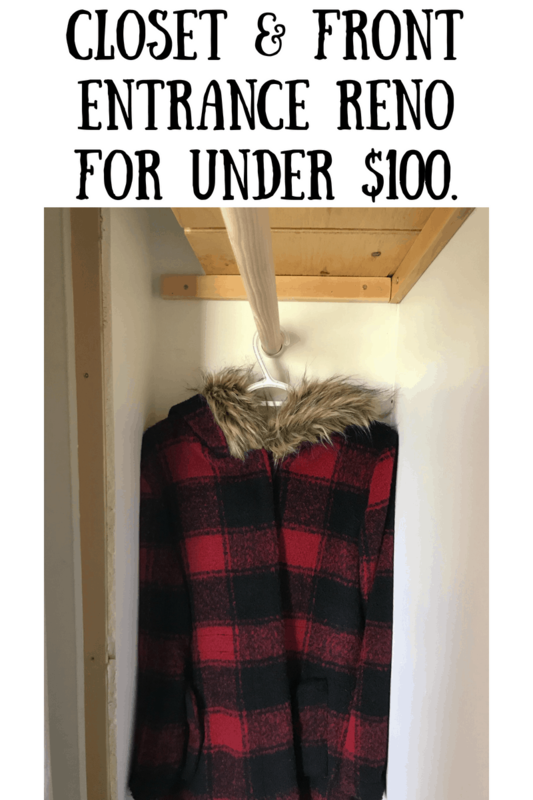 It is a VERY tight closet and a regular sized hanger just fits. It actually didn’t fit on the far end, thus the shoe rack. I had an extra shoe rack that I put at the bottom too, but something could have been built, although we may change the flooring one day so I wanted to leave it open. Paint closet door and replace knob. Tidy and organize. I went through our jackets and shoes and donated the ones that we don’t need or wear. Makes it so much easier to keep things tidy! For the rest of the front entrance way I replaced the existing coat rack with one I built a few years back out of railway spikes and also put up a key rack that we had. 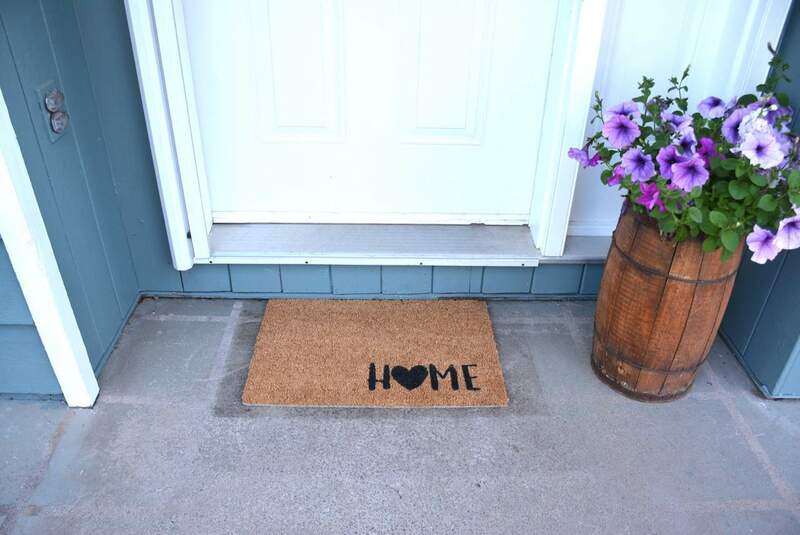 The front entrance mat was replaced with this adorable hand painted one from Pine and Sparrow and I’m still looking for a new front entrance way mat for the inside. I’d love to hear your suggestions! These seems pretty straight forward, but I tend to just start a projects then I end up not having what a need so I go buy it. Instead, make a list of what thing you have or what you’ll need, then find supplies at home that will work. In other words, plan it out, don’t just wing it. It might not be perfect, but make use of what you have. Like I mentioned about the white paint. I could have made use with the paint I had, but I wanted gloss, not matte (for easier cleaning and less scuffing) so I bought a new can. If I didn’t have plans to use the can again, then I would have used what I had at home. It might not be perfect, but the price will be right like the plywood shelving. They are nothing to write home about, but we used materials we had here and it’s good enough for a closet. My main goal was to have it functional and it is. Everyone has talents and either services or products they could trade so make use of that. Whether is a door mat or painting or just some help getting started, offer to trade. If you have a friend who is really good at these things and you want to learn offer to trade their help for watching their kids or ANYTHING! You just never know what people will trade for and the worst they can say is NO.